The Grade 4 team teaches using hands on activities where ever possible. Problem solving strategies are taught to assist students with approaching challenges. Students have also been practising their speaking and listening skills by performing plays. Students were responsible for finding and making costumes and rehearsals. In Maths we have been learning about Subtraction. Students have been extending subtraction computations by trading and renaming to three digit numbers. We have been looking at measuring the length of objects and the perimeter of our surroundings. In division we have been learning about arrays and using the formal symbols of division. We have also been learning about how remainders occur. We will also be learning about Fractions by the end of term 3. In Grade 4 we have been combining literacy, ICT and our integrated topic to create Natural Disaster websites which will be uploaded onto the World Wide Web. During literacy sessions we have been researching and collecting information from a range of sources such as books, magazines and the internet. We have been working very hard to ensure that our websites are informative and interesting. In Grade 4 we are currently learning about Natural Disasters. We are learning about what they are, how they occur and the human and environmental effects. We are trying to replicate the disasters to fully understand how they work and what they look like in action. Just recently we have made a volcano. We experimented and found that Bi Carb Soda and vinegar makes a chemical reaction that looks like the volcano is erupting. We also experimented with detergent, sultanas, flour and milk to change the consistency of the magma. We had lots of fun and made a giant mess! 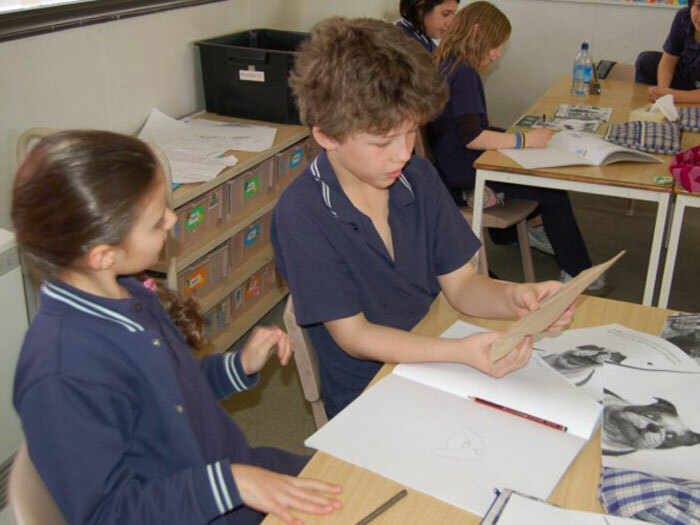 In grade 4 students are engaging with a large variety of texts from a wide range of media which are similar to texts they would encounter during their day-to-day activities. The development of comprehension skills is a major focus with the students building strategies for reading such as questioning, predicting, visualising, making text connections and inferring. These skills will support the students in becoming critical readers who question information and look for a deeper understanding of texts they encounter.